* WHAT...A mix of freezing rain and snow Saturday morning becoming all snow Saturday afternoon into Sunday morning. Total snow accumulations up to 7 inches and ice accumulations up to one tenth of an inch possible. Winds could gust as high as 35 mph. * WHERE...Along and south of a line from Marshall to Saint Peter to Red Wing. * WHEN...From Saturday morning through Sunday morning. 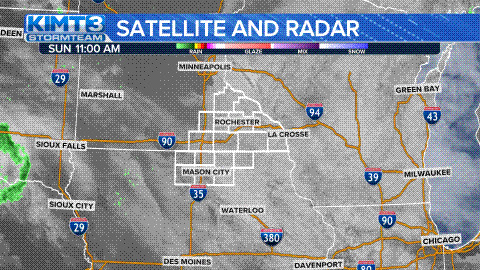 * ADDITIONAL DETAILS...Travel could be very difficult, especially along Interstate 90 and along Interstate 35 between the Twin Cities and the Iowa border. Patchy blowing snow could significantly reduce visibility. * WHAT...Heavy mixed precipitation possible. Total snow accumulations will average from 2 to 4 inches closer to Highway 20 to 6 or more inches closer to the Minnesota border. Ice accumulations of up to one tenth of an inch possible. Winds could gust as high as 40 mph. * WHEN...From this evening through Sunday morning. * ADDITIONAL DETAILS...Travel could be very difficult starting as early as late tonight. The heavy, wet nature of the snow in addition to any ice accumulations may produce isolated tree damage and power outages. * WHAT...Light mixed precipitation and heavy snow possible. Total snow accumulations of 4 to 6 inches and ice accumulations of around one tenth of an inch possible.